Dr. John Robert "Bob" Greene, the Paul J. Schupf Professor of History and Humanities at Cazenovia College, was given a research and travel grant from the Dwight D. Eisenhower Institute, which helped to fund three days of research at the Eisenhower Library (Abilene, KS), for an upcoming book on the presidential election of 1952. Dr. Greene was invited to speak at the Kansas City Public Library on the history of the Gerald Ford presidency and the pardon of President Richard Nixon. His speech was recorded by C-SPAN to be featured on their "American History" series this fall. Watch Dr. Greene's presentation "The Presidency: Gerald Ford & the Nixon Pardon" as it airs on C-SPAN 3 this Sunday, September 7, 2014 at 8 p.m. and midnight (ET). "President Ford pardoned former President Nixon 40 years ago on September 8, 1974 -- one month after the only presidential resignation in American history. On this anniversary, author and history professor John Robert Greene considers two questions: Why did President Ford pardon Richard Nixon? Was there a deal between the two men? Mr. Greene also discusses the days leading up to the pardon and President Ford's address to the nation. 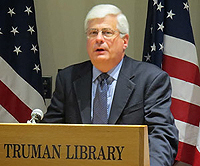 He is the author of, “The Presidency of Gerald Ford.” This event was hosted by the Kansas City Public Library and the Truman Library Institute."